TME’s offer now includes new IRM-03 series converters from MEAN WELL. They supplement IRM series that has been continuously further developed, and is available for both THT and SMD mounting. IRM-03 converters are characterized by small dimensions (37x24x15mm) and very low no load power consumption of <0.075W. Thanks to these advantages, it is possible to decrease application sizes, and follow strict standards regarding power consumption. IRM-03 series converters (similarly to converters from other IRM series) are meant to work in harsh environmental conditions. Their working temperature extends from -30°C to +85°C. Their enclosure is made of a flame retardant material compliant with the UL94V-0 standard. Tight enclosure protects the electronic components against dust and moisture. 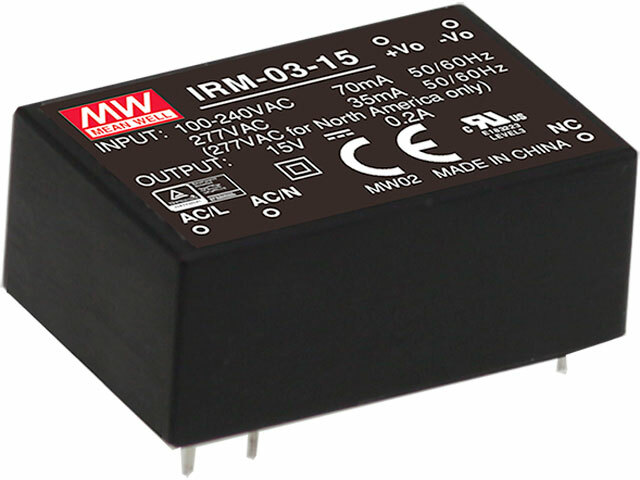 IRM-03 series converters operate within input voltage range from 85 to 305VAC, whereas output voltage depends on a particular model, and can be 3.3, 5, 9, 12, 15 or 24VDC. Furthermore, the converters are protected against short circuit, overload, and over voltage.